Come and fish the rim country! We meet the last Saturday of the month at 9 a.m. at Tiny's Restaurant. All are welcome. Come early for breakfast. Our urban lake is Green Valley Lake which is stocked with trout in the Fall and Winter and has plenty of Sunfish, Bluegill and Large Mouth Bass too. Nearby streams and lakes within 30 miles offer a wide range of gorgeous scenery and fishing opportunities. Our club is focused on fishing, but many of us are also part of our local Trout Unlimited Chapter too. 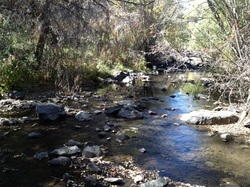 The East Verde River is where we focus most of our efforts, but we are active in any issue related to trout habitat. Click the link above for more information. You can be a member of TU, Payson Flycasters, or both if you are interested in supporting local trout fishing. 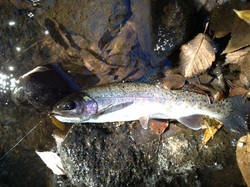 THE PRESERVATION, AND ENHANCEMENT OF COLDWATER FLY FISHING.